A two-alarm fire that tore through an apartment complex on Dwight Way on Nov. 22 is still under investigation, according to Berkeley Fire Department Deputy Chief Avery Webb. The fire, which broke out about 5:30 p.m. that evening, caused smoke damage to the fourth floor and attic of the Chandler Apartments — located at 2449 Dwight Way — as well as water damage to lower floors. Water piping that ran through the building also sustained some damage, as did the roof, which partially collapsed. The incident occurred in a business-dense area, with restaurants such as Peet’s Coffee & Tea and Moe’s Books neighboring the site. 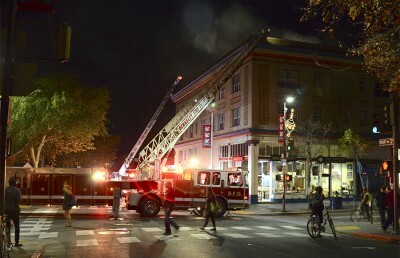 Dwight Way was blocked off from Telegraph Avenue to Dana Street as a result of the fire but later reopened. Initial evaluations indicated the fire was accidental, according to Webb, though he said there was still an investigation being conducted. Damages were initially estimated to be approximately $500,000 but could now total upward of $1 million, according to Webb. According to Webb, one individual who was hospitalized for injuries from the fire was released later that night. Nearby businesses also sustained some physical damage — including water and smoke damage — such as Gifts of Tara, Lhasa Karnak Herb Company and Reprint Mint, all located on the 2400 block of Telegraph Avenue. Another two-alarm fire in a commercial building located in West Berkeley also broke out that evening, causing BFD to employ all available vehicles across the city. BFD received aid from the Albany, Oakland, Alameda County and Piedmont fire departments as part of mutual aid agreements, according to BFD Battalion Chief Bill Kehoe. BFD also notified the local chapter of the Red Cross to assist approximately 30 tenants who had been displaced. All displaced residents will also receive $125 in direct client assistance funding, according to Red Cross response administrator Ed Silva. Zachary Surunis, who works at Joshu-ya Brasserie, located next door to the building, said that when the fire began, he heard a loud explosion and saw a man covered in soot being carried down the stairs. Surunis ran into the building and helped carry the man out. “I saw an opportunity where I could help someone, and I was ready to go,” Surunis said. The Chandler apartment complex, a four-story residence built in the 1920s with about 30 inhabitants, is owned by Virginia College Associates LP. Local restaurant Bleecker Bistro is located on the ground floor. For many years, it was owned by Barbara Moskowitz, the wife of the owner of Moe’s Books. A few graduate students live there, said building manager John Howard, but the building is occupied primarily by residents who work in the area. Senior staff writer Katy Abbott and staff writer Maya Eliahou contributed to this report. Adrienne Shih is an assistant news editor. Contact her at [email protected] and follow her on Twitter at @adrienneshih.